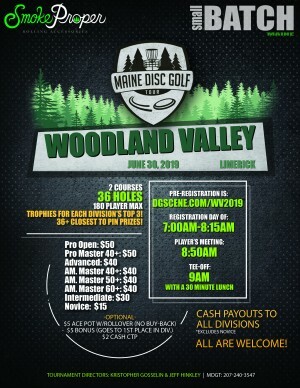 Hello and welcome to The 2019 Maine Disc Golf Tour at Woodland Valley Disc Golf! This is the 5th tour stop of 13 events. WV is a MUST play gem if you've never been. 3 fantastic courses cover several acres of land. Beautiful fairways, great lines and hole design. A very large well stocked pros shop with ample options. Great selection of snacks and beverages. Seating area with a kitchen! This is over first time taking the Tour to Woody V, let's make it a great one! I-295; south to Maine Mall exit to a left on Payne Rd., to a right on Rte 114 (Sam’s Club), to a left at 2nd traffic light (Rte 22). Go straight (becomes Buxton Rd.) to a left on Rte 202 & 4 (becomes Rte 5 at 2nd light). Go over the Ossippee River bridge, past “Welcome to Limerick” sign to a right at blinking light on Burnham Rd. and the course at base of hill on left.